Sometimes you want Taco Bell but you know you want just a bit more oomph to your meal. That is why I started making these Double Decker tacos at home. I think the DD taco lead to the Crunchwrap. Anyway you have a flour tortilla ontop of a crunchy corn tortilla. I never had one so I am not sure how they were made. My version uses refried vegan beans as glue to hold the tortillas together. 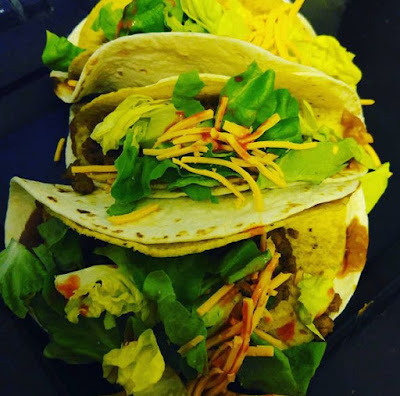 The inside is stuffed with veggie crumbles, lettuce, Daiya shreds and hot sauce. These were so good that I made them two nights in a row. I think I might just make them again tonight!